Accueil Bande originale Paroles Chansons Detroit – Paroles de la chanson dans “Le plus heureux des milliardaires”. 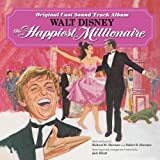 Detroit – Paroles de la chanson dans “Le plus heureux des milliardaires”. There’s a shining city west of here. Where dreams are booming into gear. It’s no humdrum, nine-to-five town. It’s a growing, going, bright, alive town. Golden sparks light up the skies there. Like a thousand Fourth of Julys there. How I want to stake a claim and. Roll my sleeves and make my name in. You can hear it humming, see it coming. Feel it everywhere you go. It’s tomorrow morning, the future dawning. With a bright and shining glow. It’s the land with golden chariots. All molten out of dreams. Oh, I could be there, I’d be free there. I’d invent new motors, design new rotors. I’d be in the drivers seat. I’d make all my dreams realities. Oh, I’d be on my way. Others are giving their dreams a try. If others can dream there, why can’t I ? Oh, you see where the rainbow ends for me. Is known to the world as F.O.B. If you hear it humming, see it coming. That’s the place where you must go. But to make your name there, you must stake your claim there. And let no one tell you no. And my dreams of golden chariots. In Detroit can all come true. For you hear it humming, and you see it coming. And you want to be there too.